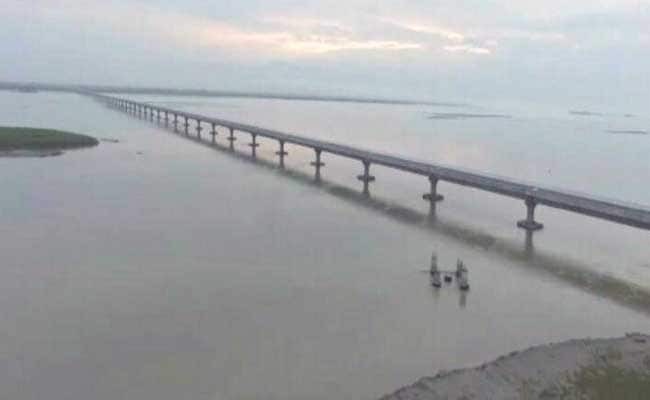 PM Modi last week opened the country's longest bridge over the Brahmaputra river that connects Assam's easternmost region with Arunachal Pradesh. China on Monday asked India to be "cautious" and exercise "restraint" over building infrastructure in Arunachal Pradesh, days after a bridge that links it to neighbouring Assam was launched by Prime Minister Narendra Modi. China claims Arunachal Pradesh as South Tibet. India has repeatedly rejected that stand, asserting that the border state is an integral part of India. "We hope India adopts a cautious and restrained attitude on the issue before the final settlement of the border issue with China to jointly control disputes, safeguard peace and tranquility in the border areas," the Chinese Foreign Ministry told news agency IANS. The bridge, built to accommodate tanks, will ensure swift movement of Indian troops in Arunachal Pradesh which will bolster India's defence along the China border. Last month, China protested strongly to the Dalai Lama's visit to Arunachal Pradesh. Beijing considers the 81-year old spiritual leader a separatist. India said the visit was to promote religious harmony and had no political colouring. The Dalai Lama, who fled Tibet in 1959 after a failed uprising that was crushed by Chinese troops, trekked through the Himalayas and entered India through Arunachal Pradesh.